Like gravity, the Law of Attraction is at work in your life everyday. Once you become aware of its possibilities, you can direct and amplify the effects to get the results you want. 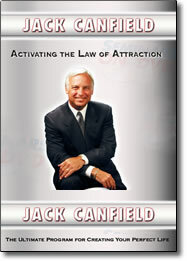 In this captivating seminar, speaking legend Jack Canfield defines critical steps and thought processes that can take your life to a whole new level. You’ll learn the three major components for attracting excellent health, abundance, and great relationships. Plus, you’ll hear powerful stories that will expand your vision and touch your heart. You’ll walk away from this program with a clear sense that virtually anything is possible when you are in alignment with what you want, and ready to receive it. Discover the ultimate seminar for getting everything you have always dreamed of, and activate the Law of Attraction in your life today!